← [Mobile Band Saw Stand] Framing the base. As some or most of you may know, my back has been injured/screwed up since, oh…late July. It didn’t really put a damper on my workshop activities till the beginning of September when I finally succumbed to the pain and sought the help of the local chiropractor. Well, after some x-rays and some scary medical jargon (I miss the good ol’ days when it was simply called a “bad back” instead of something that sounds like a terminal disease!) I was basically put on bed-rest (almost). I was allowed to stand and walk around (in order to keep the household functioning and get the kids to school, etc) but I was told no lifting, no twisting and to stay on my back as much as possible, either on the floor or in bed. And ice. I had (and have) to ice my back 20 minutes on, 1 hour off as needed. Which is a lot. That said…I can say two things now for a certainty: (1) I have made some great improvement and am cleared for light lifting and somewhat getting back to normal and (2) I still spend a lot of time on my back. 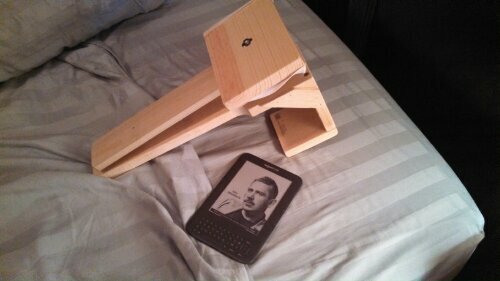 Which leads me to the triumphant return project: the Kindle Kradle! 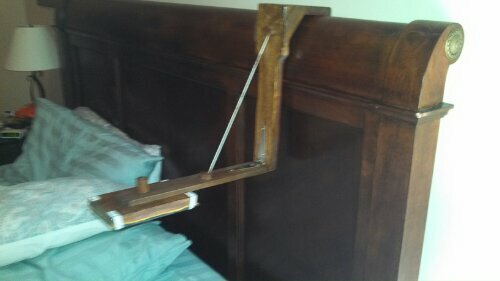 Anyway, the idea I came up with is a simple wooden frame hooked over the top of my bed’s headboard, with an arm on a hinge (supported by a rope) that extends out over my face. 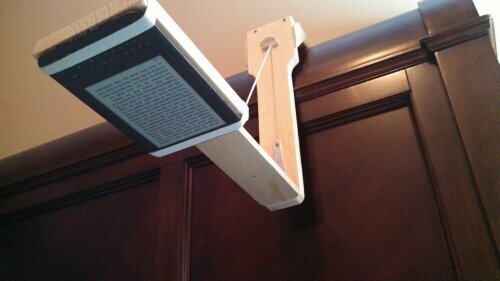 Then there’s just a block for the Kindle that’s attached to the arm. Even better, I used nothing but scrap I had in the shop and hardware that was laying in the goodie-box (you know, that place where you dump all the odds and ends like random hinges and incomplete sets of stuff, instead of throwing it out). I had to make a few cuts and these I did on the band saw, since it was sitting on my bench and at a height that it caused no pain at all to operate. Sweet. The idea is so simple, I’m just going to show you pictures, because it’s actually harder to describe in words. I know, weird. That and it hurts to be sitting down so I’m trying to make this fast. So, here we go! 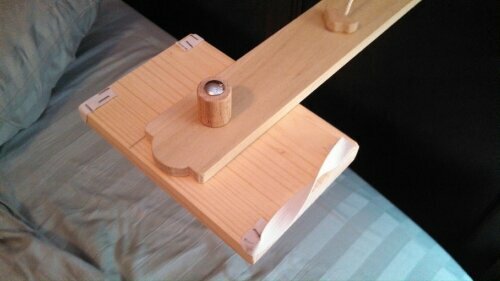 Here’s a shot of the prototype, fully assembled and sitting on my headboard. It’s made of 3/4″ pine with the little angled support pieces made out of a paint stirring stick. Everything was glued and screwed together. It’s about 16″ from the bottom to the hook that goes over the headboard. The arm extends out 16″ as well from the “elbow”. 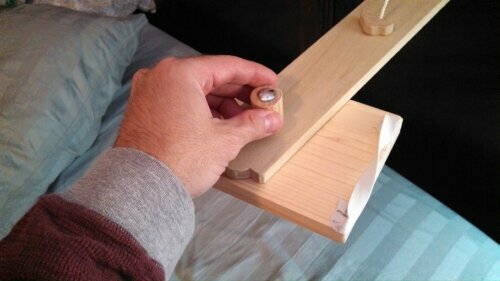 There is a spare strap hinge I had laying around holding the “arm” together, with a cord, glued into two oak holders to give the arm support. Here it is folded up so I can exit or lay down on the bed. 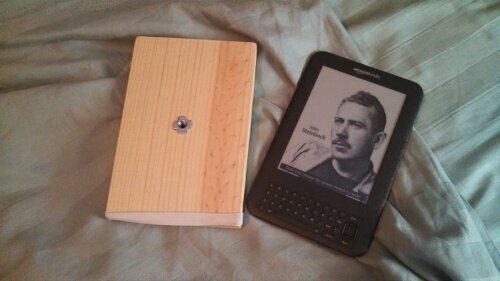 And here’s the device I designed it for, my old Kindle Keyboard. My new Kindle Fire HD fits perfectly as well (I started building this before the new toy arrived) but designed it based off specs I got online. I simply cut a piece of the 3/4″ pine to size (7.5″ by 5″) and stapled some elastic straps to the edges, so that they can hold the device in place. I also inserted a t-nut so that the little carriage bolt handle (the one I made for the aborted drill press lathe!) 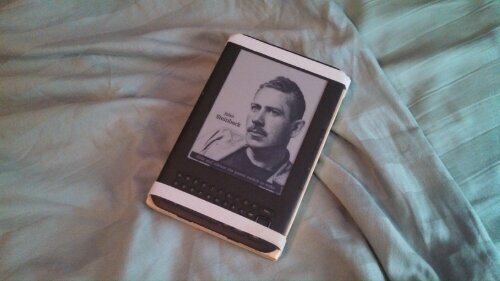 can secure the Kindle, and it allows me to easily switch between portrait and landscape mode. 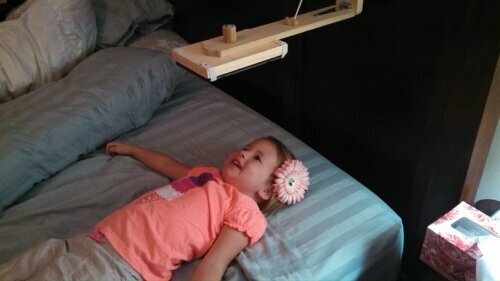 And here’s my test subject, Kylie, demonstrating the correct reading position…though she doesn’t know how to read yet. After some high fives with Kylie, I set about finishing it. A few coats of stain and some poly sealer, hit with the brown paper back rubbing and it was glossed up and not so…raw…looking. And best thing ever—my wife thought it was a pretty cool solution and actually likes it! 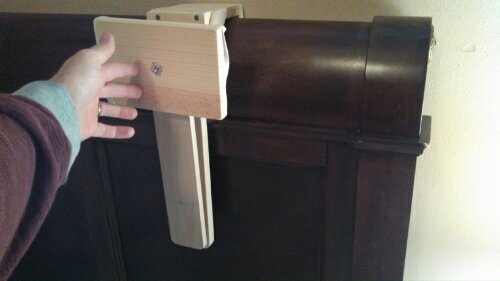 Especially after I showed her how I lined the back of all edges with felt to protect the finish on our headboard. After that, she laughed at me for having too much time on my hands. Well, that’s not really the case…the problem is I have too much time on my back. 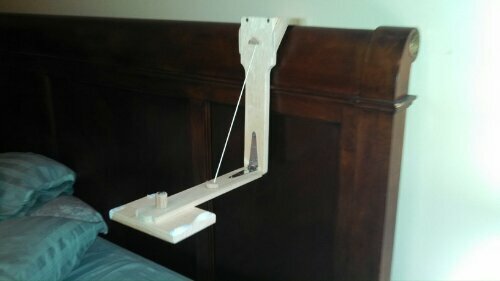 In the future, I’m planning on making a holder, maybe out of hardboard or something, that will be big enough to hold magazines or a paperback (then my wife might get one of these things for her side of the bed—seriously, it is so freaking comfortable to use, I love it). 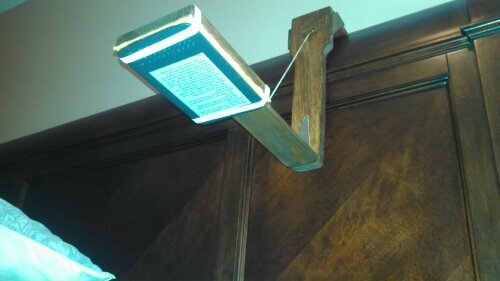 But as a bonus, I found that I can hang it over the back of any chair that will fit and lay on the floor downstairs and ice my back and read at the same time. AWESOME. No more staring at the ceiling! I may look silly (according to Kylie), but at least I can read in comfort again! This entry was posted in Projects and tagged hinges, Kindle Kradle, oak, pine, stain. Bookmark the permalink. Necessity is the mother of invention. Very cool. I like it , will provide much need relief from my arthritic hands!